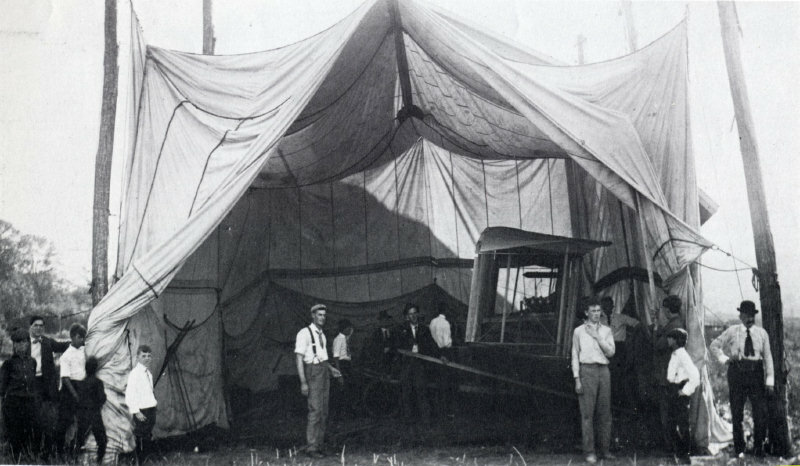 n the summer of 1908, the Wright brothers were well ahead of any other group of aeronautical experimenters on the planet by virtue of having developed a practical, passenger-carrying airplane. But news of their success had motivated other talented and determined engineers, and some of these were catching up. The next important aviation milestone was passed not by the Wrights, but by the new kids on the aviation block, the Aerial Experiment Association under the guidance of Alexander Graham Bell – "Bell's Boys" as they were sometimes called. 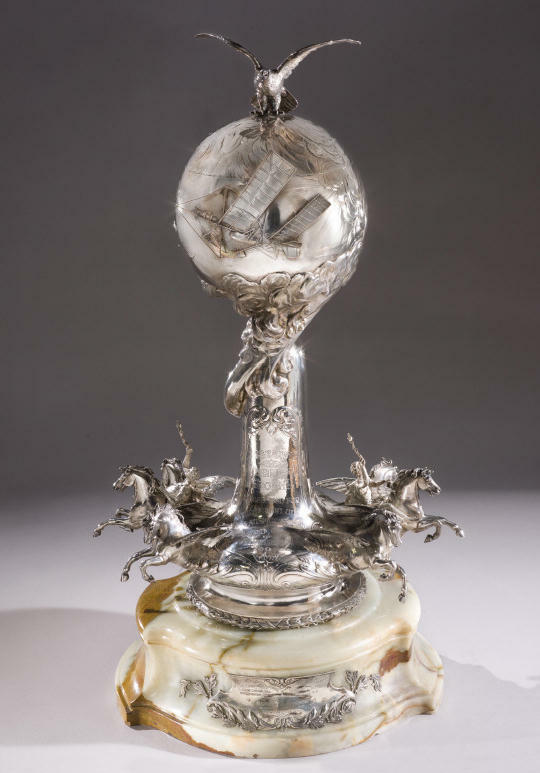 Mindful of how prizes had helped spur European aviation, the Aero Club of America and Scientific American magazine partnered to offer their own incentive – a silver sculpture called the Scientific American Trophy. This sculpture would be awarded each year to recognize a significant achievement in aviation, they announced. 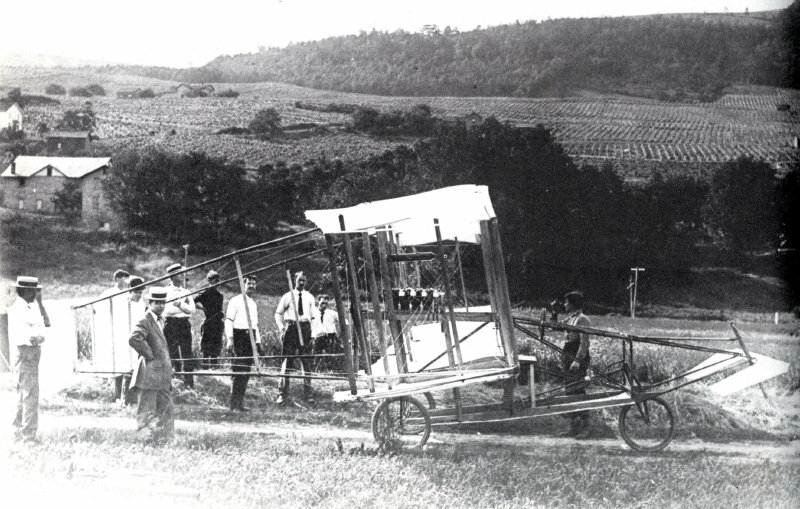 When they unveiled the prize in 1907, the Aero Club announced that they would award it for the first time to the first individual to fly a kilometer in a straight line. This was a "gimmee" for the Wright brothers, or so the presenters thought. Scientific American magazine had initially been skeptical of the Wright claims, and the editors were now anxious to mend fences with the inventors as their work drew more attention. The Aero Club had been supportive of the Wrights since the club's outset. They had been among the first to investigate the Wright's claims, then endorse them as the first to develop an airworthy aircraft. Many in the club counted themselves as supporters, even good friends of the Wrights. Allan Hawly, the president of the club, had treated Wilbur to a balloon ride when they met in France. 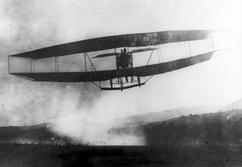 Bell's Boys completed their third aircraft in the late spring of 1908, the first designed by Glenn Curtiss. Like the White Wing, it had ailerons, a rudder, and front and back elevators. Unlike previous AEA aircraft, it wasn't called after the color of the cloth used to cover the wings. 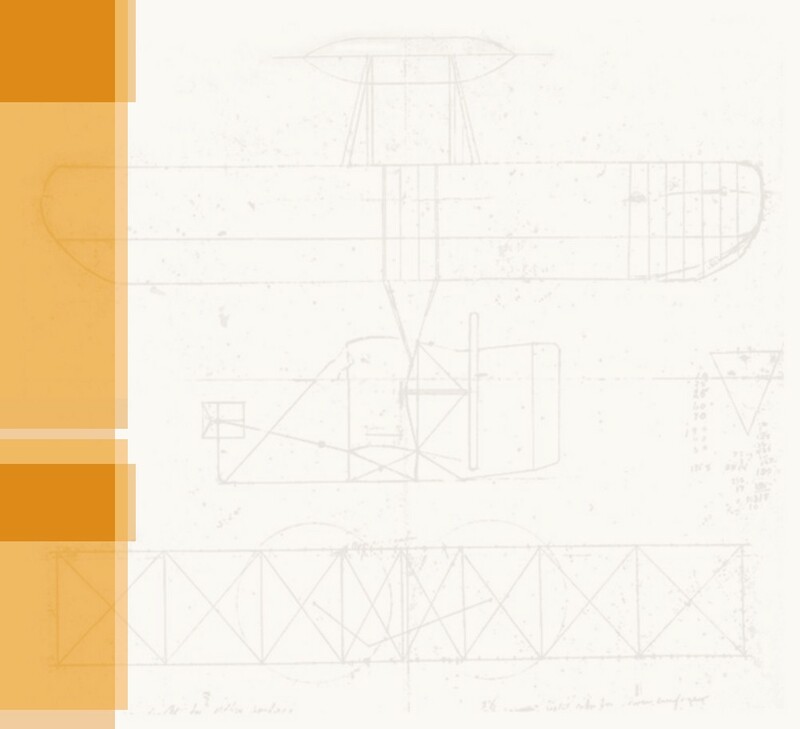 Instead, Glenn Curtiss gave the honor of naming the aircraft to Mrs. Malinda Bennitt, a friend who had helped him out when he was just starting his manufacturing business. The gesture so flustered her that "my old head just wouldn't work." Alexander Graham Bell came to her rescue, and for reasons lost to history, he picked "June Bug" – perhaps because it was completed in June. This was also the first AEA airplane that wasn't covered in closely-woven silk. It used a fine weave of cotton and the Association members were amazed at the difference in performance. On 20 June 1908, they made three attempts to get the June Bug off the ground with no success. They reasoned that air was bleeding through the cloth, reducing lift. Their solution was to treat the wings with a mixture of gasoline and paraffin to seal the fabric. This mixture was called "canvas paint" and had long been employed by sailors to seal their sails, making them more aerodynamically efficient as well as less susceptible to mildew. The Wright brothers almost certainly used something similar while experimenting in Kitty Hawk, but this was the first recorded use of what would later be called "wing dope." 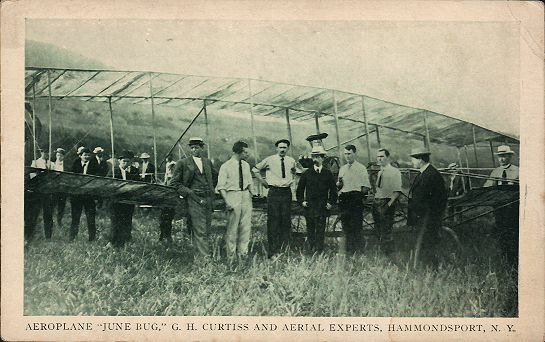 Curtiss made three successful flights in the June Bug on June 21, and within a week he was breaking his own records with flights of over 1000 yards (914 meters). The AEA was within spitting distance of flying a kilometer. Satisfied that they could capture the Scientific American Trophy, they cabled the Aero Club that they would make a run for it on July 4. The request caught the Aero Club by surprise, and the secretary, August Post, informed Charles Munn, the publisher of Scientific American. Munn cabled Orville, offering to postpone the AEA attempt if Orville wanted to try for the trophy himself. Orville, unfortunately, was swamped. He, Charlie Taylor, and Charlie Furnas were working around the clock trying to get an aircraft ready to fly for the U.S. Army trials. On top of that, Wilbur had asked him to write an article for The Century magazine that would help establish their position as the first to make a controlled, sustained flight in a powered aircraft. Finally, the Aero Club rules said the plane had to make an unassisted take-off. With everything else he had to do, Orville would have to put wheels on his airplane and find a field big enough to make a take-off run. He declined. "When I gave the word to let go, the June Bug skimmed along over the old race track for perhaps two hundred feet, and then rose gracefully into the air. The crowd set up a hearty cheer, as I was told later, for I could hear nothing but the roar of the motor, and I saw nothing but the course and the flag marking the distance of one kilometer. The flag was quickly reached and passed, and still I kept the airplane up, flying as far as the open field would permit, and finally coming safely down in a meadow, fully a mile from the starting place. I had thus exceeded the requirements, and had won the Scientific American Trophy for the first time." 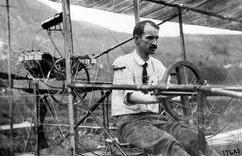 When the distance was totaled, Curtiss had traveled 5,360 feet (1634 meters) in 1 minute and 40 seconds. He was the toast of both the American and European newspapers. The Wrights, even though they had declined to compete for the trophy, did not fail to take notice. Orville wrote a stern note to Curtiss on July 20, reminding him that he and Wilbur had shared information with the AEA freely. 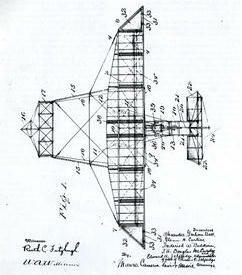 The Wrights would allow them to use the patented control system for experimentation, but Orville warned, "We did not intend to give permission to use the patented features of our machines for exhibitions or in a commercial way." 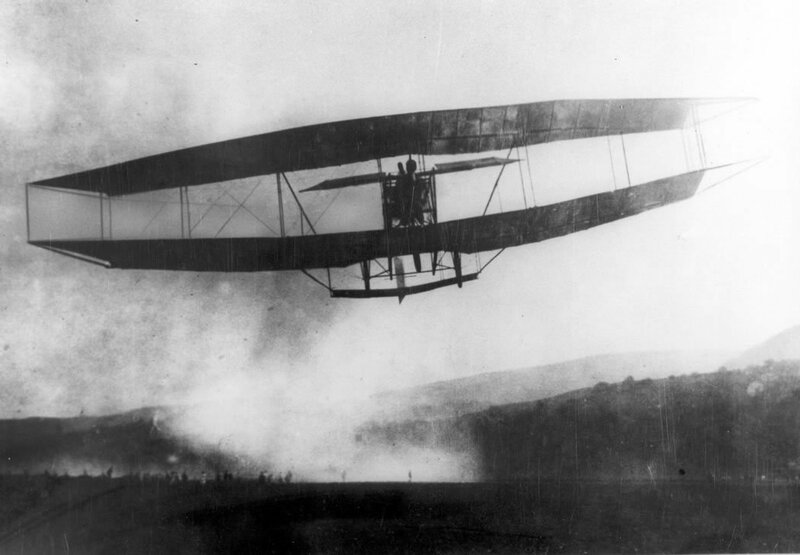 It was the first of many such communications that the Wrights would exchange with Curtiss. 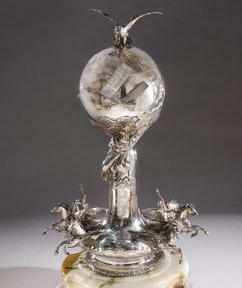 The 1908 Scientific American Trophy. Note the Langley Aerodrome on the globe. Assembling the June Bug in a tent hangar. Roll out of the completed June Bug. 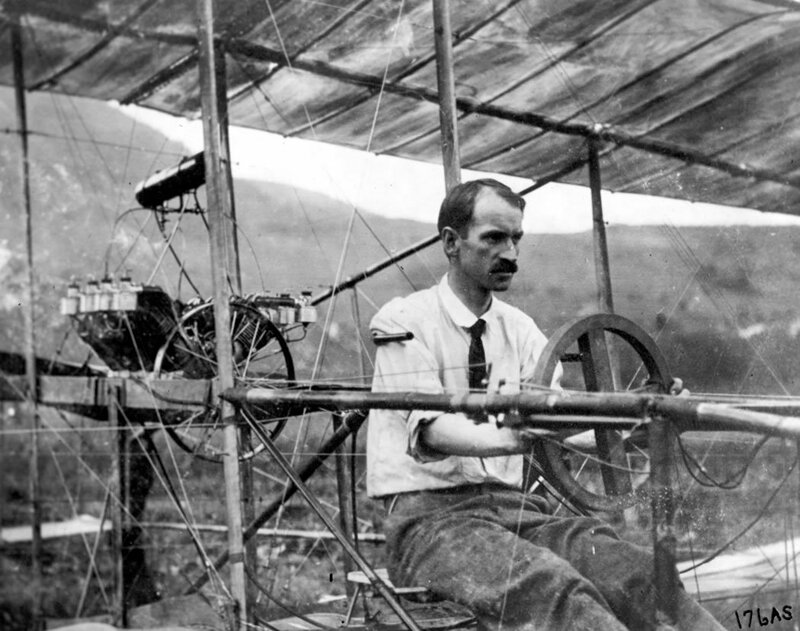 Glenn Curtiss in the cockpit of the June Bug. 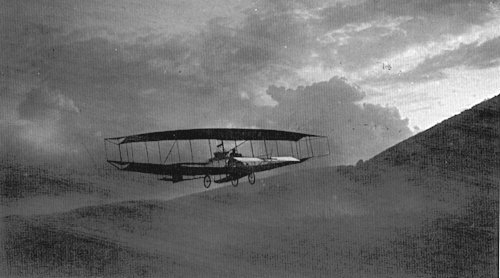 The June Bug in flight on July 4, 1908. 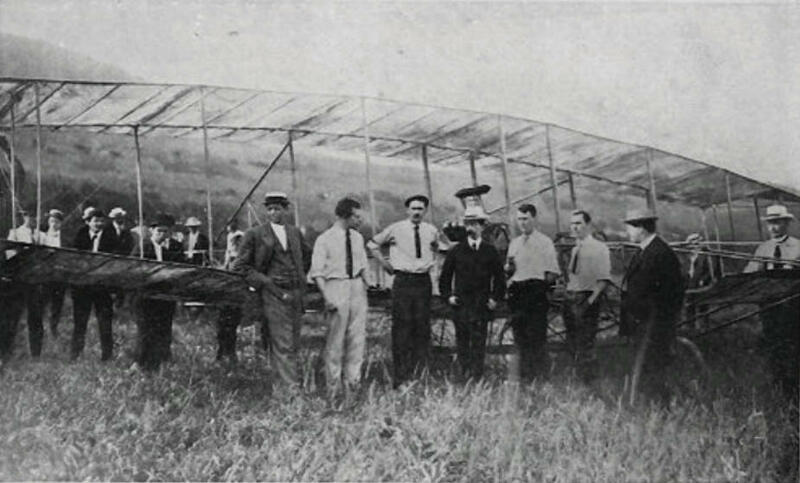 Curtiss and other "Bell's Boys" gathered around the June Big after a triumphant flight. 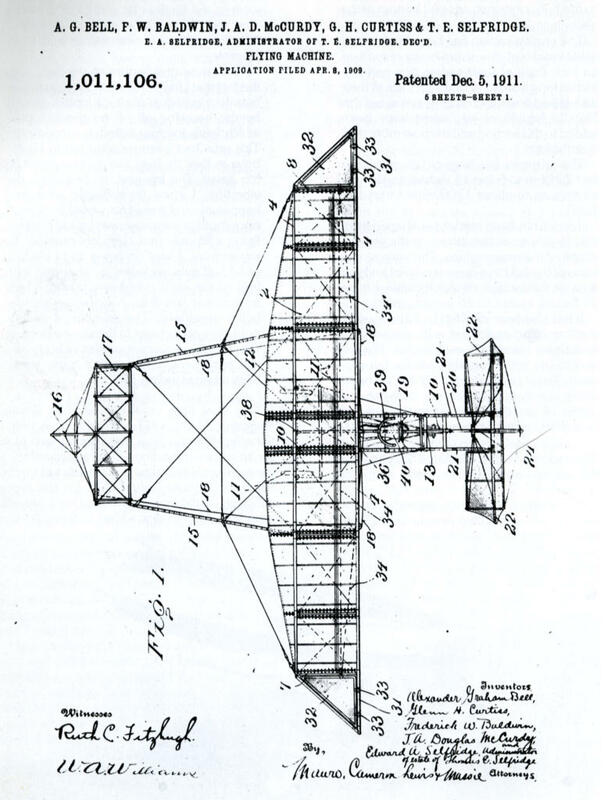 The patent drawing for the June Bug. Nos. 32 are the triangular ailerons the AEA used for roll control. After successfully capturing the Scientific America Trophy, the AEA made an unsuccessful attempt to covert the June Bug into a hydroplane. The airframe was mounted on pontoons and given a new name -- the Loon. 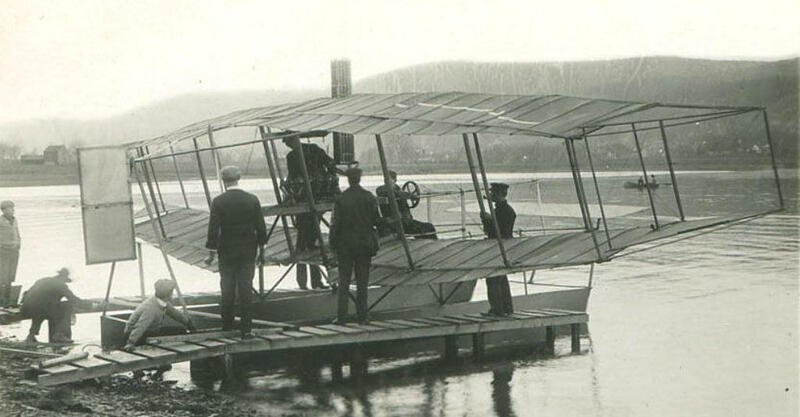 The unstepped design of the pontoons and the lack of power made it impossible for the Loon to separate from the surface of the water, but this was nonetheless one of the first serious experiments with hydroplanes in America.